There’s a reason why email is the second biggest category where marketers spend their money. Dollar for dollar, email is still the most effective digital marketing tactic available. Email confirmations are one branch of email marketing, and they can be used for many purposes. For example, when someone uses an online ordering system to purchase something from your website, they should get a confirmation email, so they know the order went through properly and when they can expect it to be fulfilled. If someone subscribes to your mailing list, they should get a confirmation email. Additionally, when a customer or reader sends you a message, you should confirm you received it even if you can’t respond just that minute. Communication is the key here if you want to run a successful online business. Imagine you find a great deal on a new kitchen gadget, and you order it then and there. You go to your inbox to make sure you actually got the deal you think you did, but there isn’t an email from the company or the online ordering system. Did you get the deal? Did the order even go through? Should you try to re-order? Lack of confirmation emails can be so frustrating for customers that they might refrain from ordering from your site in the future. A recent study of online ordering adoption in Saudi Arabia showed that the biggest uncertainty for customers was a lack of order confirmations. Setting up an auto-confirm email when a customer buys something is so simple, there’s really no excuse for brands not to do it. Just as you’d show common courtesy to a customer in a brick-and-mortar store and thank them for shopping with you, you should show the same courtesy to online customers with a confirmation email. If you don’t provide these things, then your conversions may suffer, and your bounce rates may skyrocket. Taking the time to keep your emails as high in quality as you would website content can help you connect with your subscribers on a personal level. Once they are connected, they are engaged, and you have a much better chance of turning them into lifelong customers. 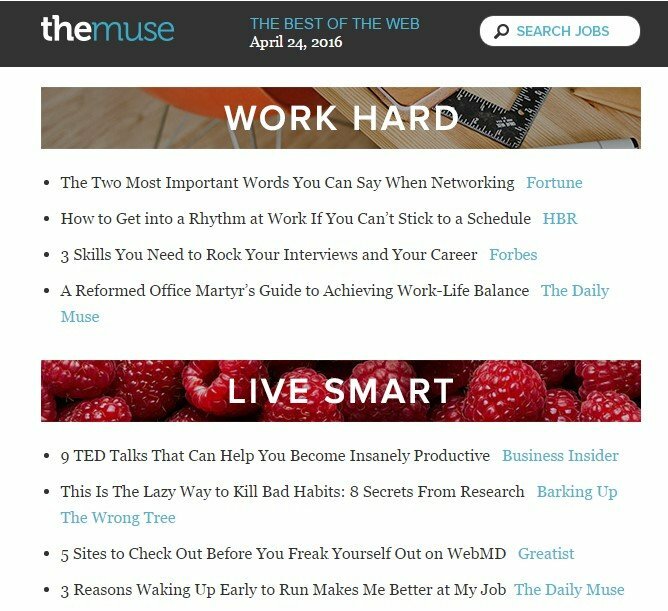 The Daily Muse does an awesome job with their subscription content. Their Sunday Inspiration newsletter is a key example of this. Subscribers get truly helpful advice about managing a career, work-life balance, and general life happiness. Rather than spamming subscribers once they’re signed up, The Muse selects the best-of-the-best content to share with their readers. When setting up your email subscription, it is a smart idea to use a double opt-in. A double opt-in simply means the subscriber must first indicate they want to sign up for your emailing list and then confirm that subscription by responding to an email the system sends. There are a number of reasons why you should do this step, including the fact that you’ll be absolutely certain those signing up are already engaged—and you’ll reduce your hard bounce rate and spam complaints. You’ll also have the opportunity to touch base via multiple email messages upon signup. The blog A Life Of Productivity uses double opt-ins to make sure that people signing up for the email newsletter really want to read it. If a site visitor was somehow subscribed by accident, the subscription won’t go through unless they click the verification button sent to their email address. Even when sending a simple message that someone has been subscribed to your mailing list or that their order has been received, your emails should look similar to your website and other branding. If you have a logo, you should use it across all your communications. Try to keep colors similar to what is on your website and logo. The last thing you want to do is come across as looking amateur or unprofessional. Many people associate logos with specific colors, so be sure you choose a couple and stick to them for everything from employee uniforms to email communication to correspondence mailed to someone’s home. 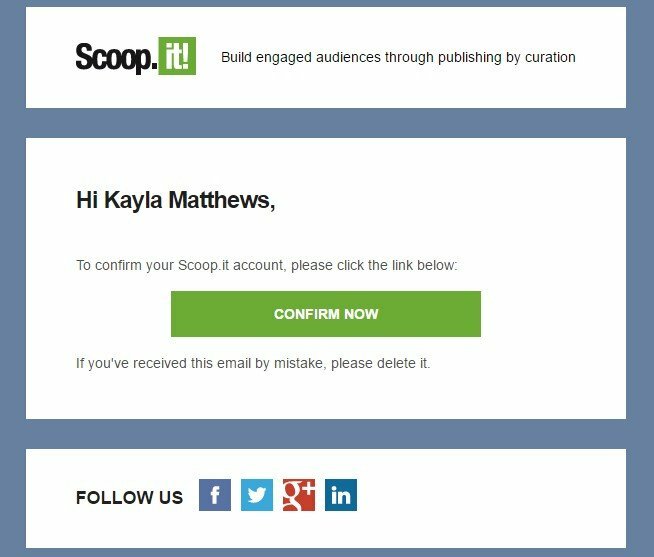 Take Scoop.It!’s confirmation email, for example. 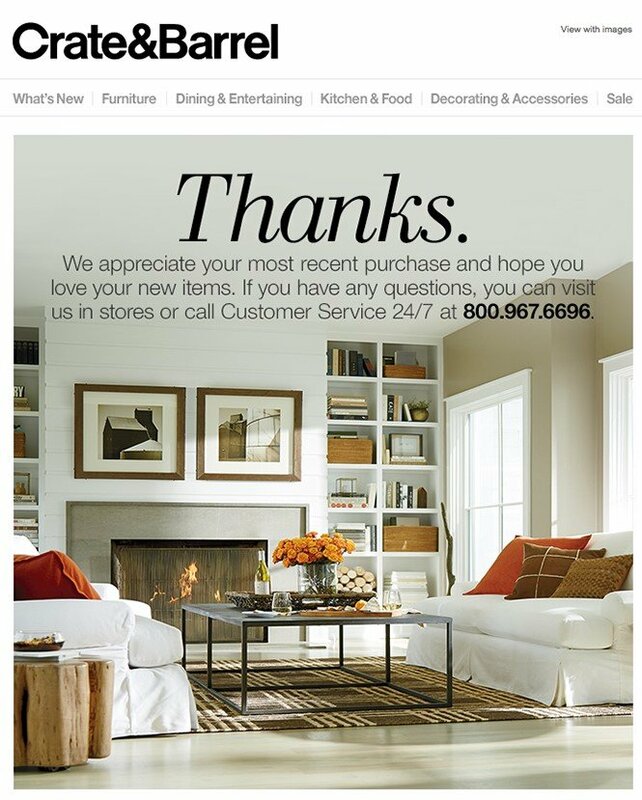 The email uses the website’s colors to not only unify the brand, but also to accent the site’s double opt-in button. 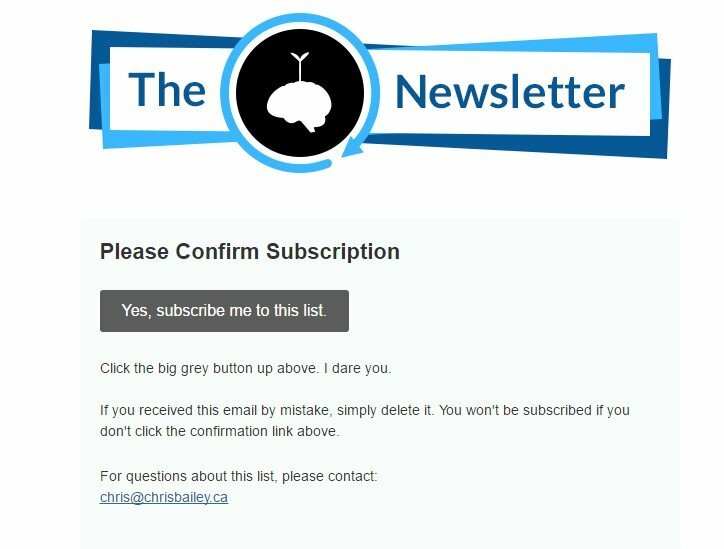 Subscribers instantly know where to click, and, as with all double opt-ins, if they were somehow subscribed by mistake, they can just ignore the email. Have you ever been emailed something from a company and tried to reply only to be frustrated with a failed-to-send message response? A no-reply email frustrates your customers. Instead, use a dedicated email to send out your messages and to keep business emails in a central location so you can answer customer concerns quickly and decisively. This level of customer service will help develop your reputation as a company that cares about its customers. After you’ve set up confirmation emails, be sure to test them. You’ll also want to open those emails on multiple devices and make sure the appearance is exactly the way you’d like. 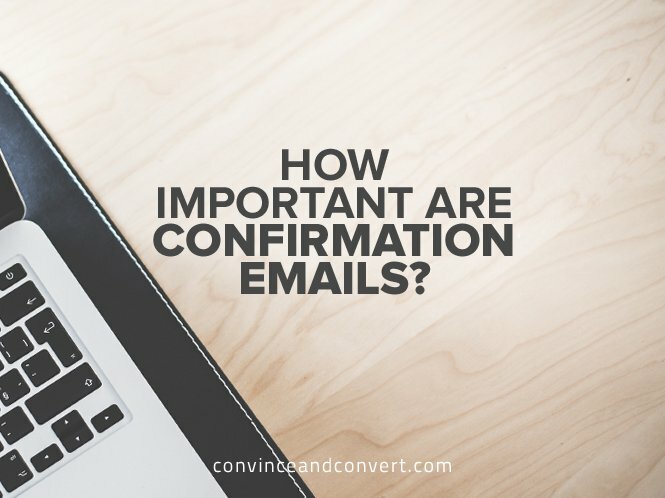 Using confirmation emails can help you develop a better relationship with your customers—and turn subscribers into buyers.